Motor City Riot cordially invites you to our SECOND MOPED RALLY in Detroit from August 21 to 23, 2015. Registration is $10. 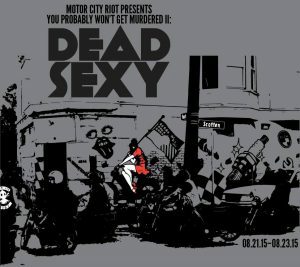 You can register online here: http://motorcityriot.com/rally. Registration includes a rally pack, meals on Saturday, t-shirt, some free booze, and specials at the Saturday night party. . If you cannot register in advance, you can do so in person on Friday or Saturday. You must register to ride in rally! We will be raffling off two custom-built and detailed mopeds as well as other prizes at the Saturday night party — a custom rigid Motobecane and a V1 Aspes. Photos will be posted below. Purchase raffle tickets in advance on the rally page — or in person on Saturday. The long ride will take place on Saturday and leave from the ONYC. There will be a chase vehicle to pick up all breakdowns along the route. Average top speed of the ride will be @ 35mph, and Detroit has potholes here and there, so plan accordingly! Discounted lodging for the rally available at Hostel Detroit.http://www.hosteldetroit.com/. The hostel is a super cool spot and central to all rally events of the weekend. Rates are between @ $35 per night for a group room and @ $74 per night for a private room. Call “Zach” at the Hostel and tell him that you are with the Motor City Riot rally. We suggest that you reserve as soon as you can. Sorry — there is no public outdoor camping permitted in the City of Detroit! 2:00 — 9:00 PM: Registration at Jumbo’s Bar. 9:00 PM: Opening Ceremonies at Jumbos. 10:00 AM – 1:00 PM: Breakfast at the Old Nasty Yacht Club. Gas up and get ready to ride. 1:00 PM — 8:00 PM: Long rally ride with food stop along the way. 8:00 PM — 10:00 PM: Rally party at Nancy Whiskey’s Detroit. @ 9:00 PM: Raffle drawing. @ 10:00 PM – ? : After Party! 10:00 AM – 12:00 PM: Breakfast Rides. 12:30 PM – 3:00 PM: Sunday Ride.